Learn more about the benefits and limitations of blockchain distributed ledgers for highly regulated industries like finance, healthcare, and supply chain. You’ve heard about Bitcoin. You’ve heard about Ethereum. You’ve heard about ICOs. You know their purpose and their function, and maybe you’ve even used them before. But we want to take a closer look at what’s happening at the most fundamental level that allows these technologies to exist — and to be applied across every kind of industry, from healthcare, to finance, to supply chain? Businesses in highly regulated industries must keep detailed, accurate records of their transactions to maintain good business relationships and comply with laws and regulations. When there’s a mistake, the consequences could be as serious as an audit, steep fines, or lawsuits. This is made even more complicated when multiple companies do business with each other. Each party involved has their own separate system to record the transaction. Today, there aren’t systems or business processes in place to keep all these disparate data sources in sync. It’s a really tall order, from a computer science perspective. One of the simplest things we can do is maintain a common system of record into which we can write our transactions with varying degrees of confidentiality. It’d essentially be a shared database that would inherit some of the attributes that have been shown to work in the cryptocurrency community, like immutability. You write something to it and broadcast it to the network; once it’s there, no one can deny that it was written — because everybody’s copy of that database is the same. This concept can be used to keep somebody from selling the same house twice. If we see that somebody’s already sold the house, and they’re trying to sell it again, we can reject the transaction. At its core, a distributed ledger is a type of database that’s spread across multiple sites, regions, or participants. The database is independently held and updated by every participant (or node) in the network. Each node processes every transaction and then compares their results with the results of the rest of the nodes. Records are only stored in the ledger once the majority of nodes reach a consensus. The blockchain is just one particular type of distributed ledger, and it’s most widely known as the technology that powers bitcoin, Ethereum, and other cryptocurrencies. 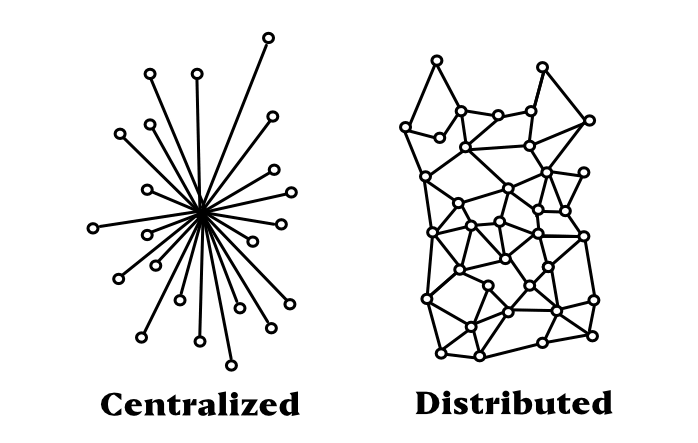 As you might expect, a distributed ledger mhttp://www.verypossible.com/services/blockchain-developmentust be decentralized, otherwise it would be no different than the centralized databases most companies use today. By removing the intermediary from transactions, companies can reduce errors, fraud, and transaction costs while increasing efficiency. To understand how nodes come to an agreement, it’s helpful to think about how we’d come to an agreement if we were all sitting in a room together with pens and paper. One of us would yell out, “Entry #1 is this.” Someone else says, “Entry #2 is this.” We’d look around and nod and agree. If two people yelled out transaction number three at the same time, we’d need a consensus mechanism to decide which one of those people “wins,” and which one becomes transaction number four. Consensus mechanisms are at the heart of blockchain distributed ledgers. You might’ve heard of proof of work, used by the cryptocurrency communities. Essentially, it enables a very large audience to run a lottery that decides who gets to put that next block in the chain, or that next entry in the ledger. It’s a very computationally expensive approach, but it works when you’re talking about anonymous records and thousands or even millions of participants. But in most business networks, we’re not actually anonymous to each other. We enter into a private network through an agreement with a set of rules, and some of those rules we can encode in the form of smart contracts. We can automate a process that says: when you want to look up a piece of confidential information on somebody, do you have the rights to do that? Where does that data sit? Take healthcare, for example. Using these private networks, we could build all sorts of interesting things, from provider directories to care platforms. We could keep patient information confidential, while creating pathways to the data and recording items like consent receipts. Other infrastructures could be possible — like a “wallet” for patients, which contains their healthcare data, allows them to share it, and tracks its history so that they know exactly who has access to that data. There are some things distributed ledgers can’t do. We can use all sorts of cryptography to keep confidential data confidential. But, occasionally we make mistakes, and we might make a mistake that reveals highly personal information — like a patient’s HIV test results, or even the fact that they had an HIV test — to others in the network. So networks like this need a legal framework that complements the technology framework. Essentially, something that says: "If you happen to obtain access to information you shouldn’t have had access to, you don’t have the right to share that data." There must be some governance mechanism that allows us to correct inevitable mistakes. As the technical folks work on the plumbing, we’re going to see the growing need for permissioning systems. Will there be organizations that validate participation in those networks? Will there be organizations that validate the legal frameworks that participants agree to? If we do those agreements right, they should be the equivalent of a click-through agreement on a website. In other words, they won’t be a barrier to growing these kinds of networks to the full audience they’re intended to serve.